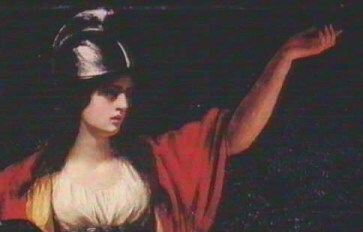 These women warriors, and others whose names come down to us from our illustrious past, are invariably brave and aggressive. While such extra-ordinary behavior is not the norm for women, even in Aryan societies, and does not represent our traditional role as it's come to be preferred, it nevertheless sets a standard of courage and sacrifice that we women of today can emulate. For us, being a White Warrior Woman is a state of mind. The women of present-day India love the story of Vishpala because it inspires them to overcome obstacles in their own lives. The women of Iran likewise repeat the story of Gordafarid to remind themselves of their own inner strengths. 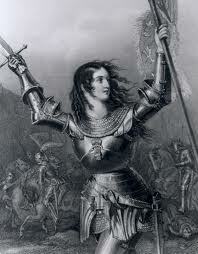 We, the racial descendents of white Europeans, have many brave heroines to look to for inspiration, from Jeanne d’Arc (pictured) to the incredible American Revolutionary War “soldier,” Deborah Sampson. Our history is clear – in early Aryan civilizations women were treated with respect, and their place in society, though different, was essentially equal to that of men. But under the invasive foreign influence of priests and other self-appointed religious authorities, women, in time, lost many of their rights and privileges. The Talmudic tradition, as well as orthodox Islamic clergy, relegated women to a dependent role under the rule of father or husband. Following the same tradition, the Jew Paul (Saul) turned Christianity toward a non-Aryan form of patriarchy which was ripe for abuse, a position not found in the teachings of Christ. I believe strongly that women have an essential role to play in securing the victory of our people. We must realize, clearly and cogently, that we are participants in a battle – a struggle – for not only the survival and well-being of ourselves, our families, our tribe and our nation, but for the ultimate triumph of our race. In this battle we must be impeccable in our warrior state of mind - a state of mind that knows it must, first, possess knowledge, and then strength of mind, great heart, and true instincts. This is a large order, and is the reason why not many modern women are racial warriors. The most common behavior white women exhibit today is not recognizing their enemy. Too many praise the enemy and the “outsider” and demean their own. They don’t understand that while other cultures may have some agreeable qualities – they may not be totally bad or wrong - they're not our culture. They haven’t developed from our racial history and kin to be suitable for our temperament, and thus insert a jarring note into our national harmony. Many women have additionally fallen into the trap of believing that to be dominant or to be victorious is to be unjust and heartless. Of course, this is taught in our schools. A good example of this was brought to my attention by an American Indian, David A. Yeagley, in an article What's up with White Women? He tells of a student who spoke up in one of his college classes, praising his American Indian culture and saying of her own white American culture, "I don't see anything about my culture to be proud of. It's all nothing. My race is just nothing." It turns out that this young woman was "not proud of how America came about," meaning the defeat and consequent suffering/dislocation of the American Indian population. In her youth and inexperience, she was playing up to her college professor, no doubt believing he would approve of her disavowal of her own culture and her favoring of his. She was also expressing white guilt. In 1941, in the village of Pontcharra in France, with all the men away fighting the war, the women of the village donned their best dresses to celebrate Bastille Day, and as it turned out, that was the day they gave themselves to the German conquerors. We might ask of our young college student: Who had conquered her people? Or perhaps we should ask: who, or what, had conquered her? Yeagley, speaking as a Comanche, said he was proud it took the most powerful nation on earth to defeat him because a warrior is measured by the strength of his enemies. It did not make him proud to hear this student praise his culture over her own; it made him feel less worthy. “If her people are nothing,” he asked, “what does that say about mine?” It made him not want her on his team, either. Another aspect of this story is that the other students in the class made no comment to her disparaging words. They listened in silence, not wanting to offend their instructor or open themselves to criticism by disagreeing with their fellow student. They failed to speak up. One of the obligations of White Warrior Women is to speak up. We must tell the story of the white race, and tell it proudly, without fear of being called a racist or other labels intended to silence us. Racism is no more than another word for patriotism – a righteous cause for which millions have died. The greatest crime in all nations, as judged by patriots and neutral parties alike, is to help an enemy destroy it.